Strong branding makes your distinctive presence shine. It’s the welcoming open door for your intended audience and all the world. Brand equity—the present and future value of your brand—accrues in people’s hearts and minds based on their imaginative associations with your branding, their experiences with your business or organization, and the fulfillment of their needs by your products and services. Branding is more than a logo. It presents a complete “look & feel” for your enterprise, including name, taglines, messaging, logo icon, logotype, auxiliary graphics, images, family brands, and color palette. Branding supports and informs all of your internal and external communications, as well as your ongoing strategic planning. Christine Walker uses dynamic visual and verbal processes to elicit a clear vision and authenticity for evolving the distinctive presence of your brand. She brings her skills as a visual strategist, designer, artist, and writer to create strong new brand identities or build on classics. 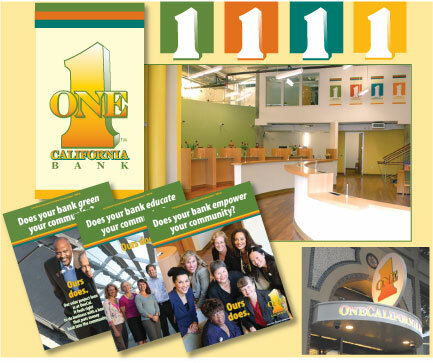 In 2006, Christine was asked by a forward-thinking team of stakeholders and executives to lead the identity development and branding for their new and innovative community development bank, OneCalifornia. Starting in fall with the team, nearly year before the bank officially opened in the summer of 2007, she used visual and interactive facilitation to draw out imaginative participation and consensus for the branding program. 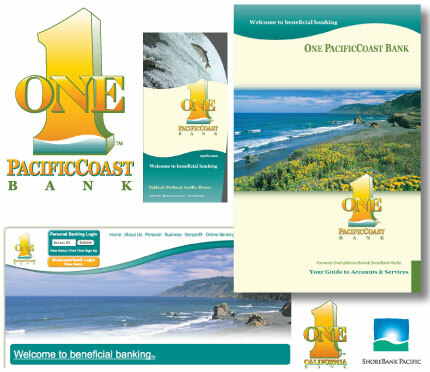 As a consultant, she designed and evolved the branding for a wide range of applications in print, online, media, and facility design to establish the “look and feel” of OneCal and created messaging for “Building on One Success at a Time” in a new approach to socially-responsible banking to benefit the community, and subsequently created all the marketing communications for the next several years. The bank has continued to grow through acquisitions and mergers and expand its reach. It was named by B Corp the Best in the World for 2014. In July, 2014, the Bank rebranded to Beneficial State Bank. “Tell it again!” chorus Phillip and Cheri Marcucci’s grandchildren—Martino Fava’s great-great-great grandchildren—when they sit around the Marcucci dining table and listen to the old stories. Phillip is a history buff as well as vintner. The family knows that farming your own land is a good life, and the newest generation is learning every step. 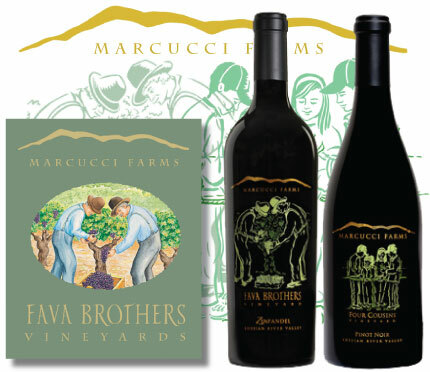 Marcucci Farms & Fava Brothers Vineyards began as the dream of Phillip’s ancestors, Martino and Lorenzo Fava, two Italian immigrants who in the 1880s left their home in Lucca and settled in the Russian River Valley of Sonoma County, California. Inspired by this delightful family, their farm, and history, Christine developed the branding for the Marcucci Farms new line of wines—Fava Brothers and Four Cousins. She also wrote the narrative copy for use in web and print marketing. 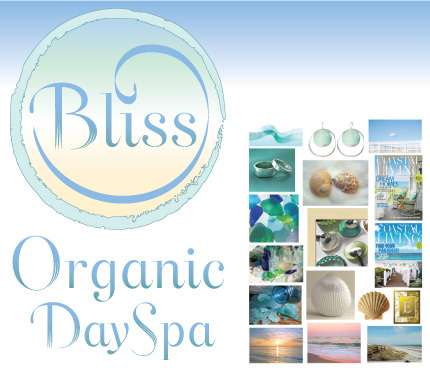 The owner of start-up Bliss Organic Day Spa had a clear sensibility for her business when she approached Christine to design the branding. An earlier attempt with another designer had resulted in a design that did not align with the owner’s strong aesthetic. In facilitating a new branding process, Christine developed a visual “palette” of forms and colors, helped the owner articulate and refine her vision, and created a new logo design and branding elements for business papers, signage, advertising, and website. 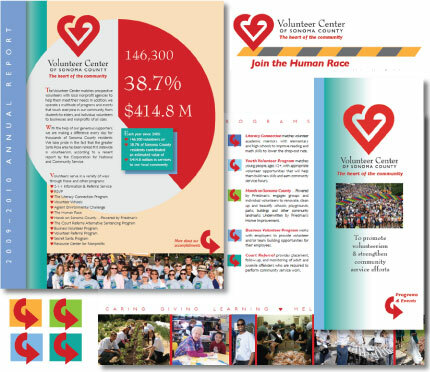 The Volunteer Center of Sonoma County had a strong logo but did not have an integrated look throughout their branded communications. Christine built versatility into their branding to cohere the different programs of the organization while retaining their distinctive qualities. She also created live meeting capture visuals at the 2010 Nonprofit Conference, including keynote speaker and world café groups, and created a followup webpage and narrative. 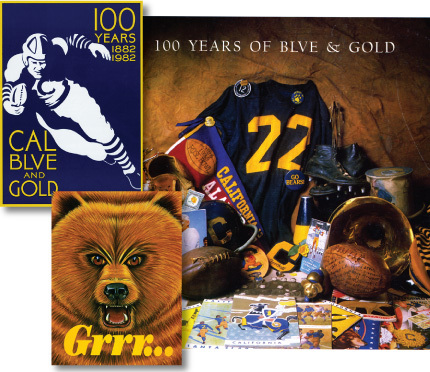 During the course of several years as a creative consultant for the University of California Athletic Department, Christine Walker built on classic themes of Cal Blue & Gold and Cal Bears to create logos, posters, billboards, programs, and marketing materials. She conceived of campaigns, painted bears, art directed photo shoots, and wrote and designed a variety of print publications. These many years later, her bear paintings reside in homes of Berkeley alums and have been reproduced on collectibles.